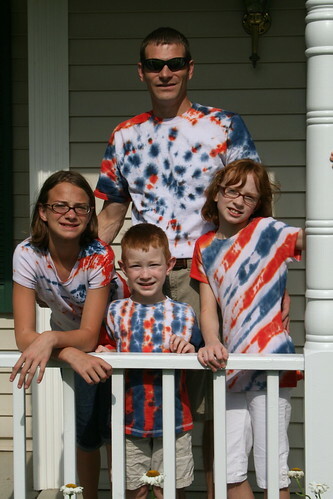 Here's the patriotic shirts we made. (Mine didn't turn out. Second year in a row. Maybe I shouldn't have a tie dyed shirt.) They are ready to party at Jan and Doc's house with a ton of family. There's sure to be good food, lots of fun, and great fireworks over the lake. Ok, here I am leaving a comment! I got in and got my password ha. Sorry you missed it, Kelly! Hope you feel better. Your mac n' cheese was so so good! The shirts look great. We missed you at the party. Hope you are feeling much better. What a great 4th activity!